"Erectile dysfunction, impotence, benign prostatic hyperplasia, kidney and bladder infection, dysuria (painful urination), prostatitis (not acute or infectious), kidney or bladder stones (not acute or infectious), and Peyronie's disease (blockers ureters), from Rosita Arvigo's Ethnobotany of Belize. 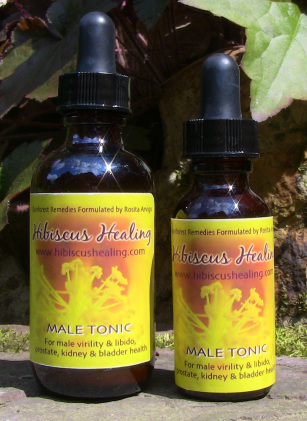 Specifically for men, this tincture increases male virility. If a couple is looking to conceive a child, this herbal blend may improve the likelihood of success. It also is restorative to the kidneys and bladder. *Not to be taken by women. May interact with cortisone products. Balsam Bark, Corn Silk, and Man Vine.